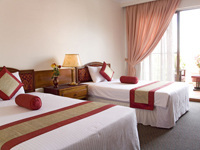 Angkoriana Hotel is located only 4KM from the World Heritage Site, Angkor Wat. Angkoriana Hotel is on the main road to the Temple grounds which is only about a 5 minute drive away. From the airport, we are only a 15 minute drive away. Situated near the Royal Palace, our location is ideal for touring the town of Siem Reap, right in front of the National Museum of Angkor. Angkoriana Museum Restaurant is set in beautiful khmer garden and all wood veranda. We provide pool side dining at its best. Our Rooms are decorated in an inviting style with all the comforts one may need for a relaxing vacation. Room service, mini bars, laundry service, daily maid service, and in house massage services are all here for you to make it easy to relax after a day of Touring the Temples. We can arrange all Transport, Tours or specialized services in Siem Reap or other places that you would care to visit or see. 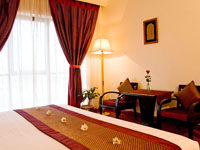 Angkorina Hotel offers FREE 2 MB high speed wifi throughout the hotel. Swimming Pool open 24 hours. Specialized Packages for Honeymooners and Birthdays ( Flower covered beds with Champagne, Chocolates, Fruit Platters etc). Waiting on you at arrival or upon your requested time. - Cable TV with more then 70 channels. - Phone (local and international). - Bath-tub with integrated shower. - Electric shaver outlet. - Bathroom amenities. - Iron (up on request). - Iron board (up on request). - Umbrella (up on request). - Private balcony (some room).